Gold ruby glass, at the Wittelsbacher in the Munich Residenz. The glass with the lid is attributed to Johannes Kunckel. Calcine gold so that it becomes a red powder. This calcination is done repeatedly with aqua regis, pouring it over [the gold] five or six times. Then put this gold powder into a small earthen pan to calcine in the furnace until it becomes a red powder, which will take place after many days. Sprinkle this red powder of gold [gold chloride] over the fused glass. Use fine cristallo, thrown in water many times. This gold powder, given in proportion little by little, will make the transparent ruby red glass; but you must experiment in order to find it. 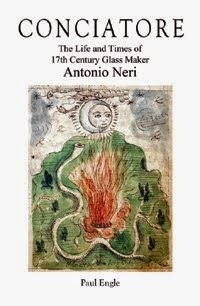 To be blunt, by itself this recipe does not give enough information to reliably make the fabled red glass. Neri must have known this, as alluded to in the line "but you must experiment in order to find it." Neri's German translator Johannes Kunckel successfully made gold-ruby glass, but he too declined to disclose his method, although several beautiful examples of his do survive. Much later it became generally known that the addition of small amounts of tin will produce a dependable red color. It was not until the twentieth century that the underlying chemistry was understood. It appears that this color glass was produced even earlier by mosaic makers and enamellers, who routinely added tin to opacify the melt. 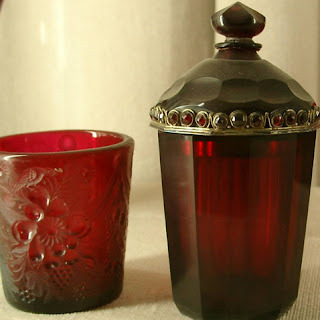 The difference between their creations and transparent ruby glass was the amount of tin used. Deep transparent ruby glass requires only miniscule amounts of tin and gold. More tin makes the glass opaque and lightens the red color. There was one final secret necessary; the glass must be 'struck' in a special process. The freshly made glass object is cooled then reheated to bring out the deep red color. In 1568 Benvenuto Cellini clearly described the striking method for gold-ruby enamel. … when it has once more cooled you put it in [the kiln] again, but this time with a much weaker fire, until you see it little by little reddening, but take great heed that when it has got the good color you want, you draw it rapidly from the fire & cool it with the bellows, because too much firing will give it so strong a color as to make it almost black. Benvenuto Cellini, The Treatises Of Benvenuto Cellini On Goldsmithing And Sculpture, Charles Robert Ashbee, ed., tr. (New York: Dover, 1967), p. 20.